Cutting leaf celery never really grows a stalk, just hearty stems and leaves. It’s prized here in Pennsylvania because traditional communities that subsist on their own agriculture can grow it in high tunnels and use it for celery flavor all year round. We love it for the flavor it gives our vinegar; green and herbal, but sweet and tawny. This celery ends up coming through a bit hearty, like the flavor of celery seed. 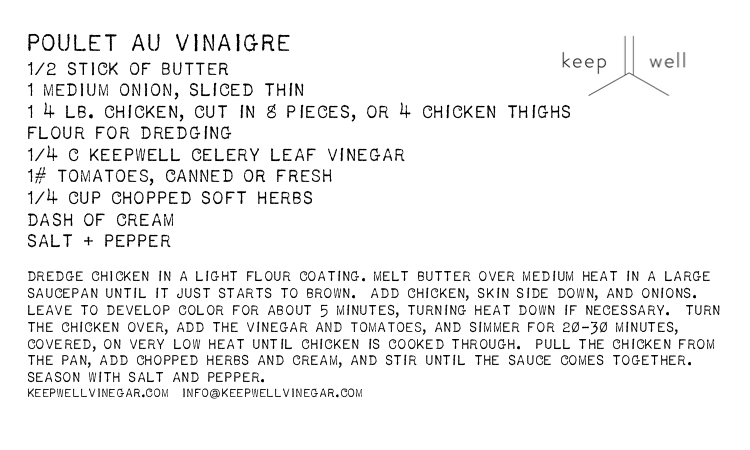 This vinegar is wonderful in a simple shrub, if you’ve ever heard of celery soda, and gives a decidedly savory edge to stewed dishes, like poulet au vinaigre.